Feb 5, 2019: Any topic on modern-day pickup trucks is never complete without the inclusion of the Isuzu D-Max. It is an excellent pickup truck and is more modern and better-looking than the Mahindra Bolero Pickup. It has a similar setup like most other pickup trucks with a deck body and a day cabin built on the chassis. The Isuzu D-Max pickup truck has a total GVW of 2,850 kilograms, while the maximum payload capacity is 1,200 kilograms. It has a 4x4 axle configuration and an off-road gradeability of 27%. The suspension is handled by independent coil springs at the front and rigid with leaf springs at the rear. Stopping power is supplied from drum brakes, and parking brakes are offered too. The pickup truck is powered by 2.5-litre, 4-cylinder engine that can churn out a maximum power of 78 bhp, along with a peak torque of 294 Nm. This power is then channelled to the wheels via a 6-speed manual gearbox. The current market has many needs which can’t be fulfilled by using bigger commercial trucks, thus small ones are required to reach the remote areas. There are a lot of options available in the market under this niche, however, only a few have been effective with their power, load carrying capacity and other options. One such truck is Isuzu D-Max, which is available in 4 variants. 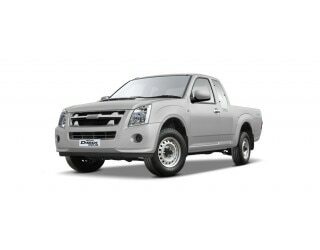 With different cabin and load body options, this pickup truck from Japanese auto maker Isuzu meets the buyer's demand quite easily and has many cabin features to make the drive comfortable. Fitted with best in class 4 Cylinder 2.5 Litre 2,499 cc Common Rail Turbo-Charged Intercooled Diesel engine, Isuzu D-Max is able to churn out a handsome power of 134 hp @ 3,600 rpm and decent torque of 294 Nm @ 1,800 - 3,200 rpm. The torque is quite effective with the load capacity it has and makes the truck move easily at the start. The 5+1 forward + Reverse gear transmission box and Single Plate Dry type clutch available in Isuzu D-Max also help it to hit the top speed of 175 km/h and with gradeability of 27%, it could climb steeps quite comfortably. Available in 4 variants, the wheelbase and turning radius for D-max is same, that is, 3,050 mm and 5,900 mm. The pickup is offered in several body type options such as (A) space cab with arched deck, (B) single cab with flat deck, (C) single cab chassis and (D) space cab with flat deck. The ground clearance of 195 mm is same for all body options, however, dimensions like length, width and height are different for each variant. Talking about the weight, the Gross Vehicle Weight (GVW) of Isuzu D-Max is 2,850 for all, but the kerb & payload weight for variants A, B, C and D is 1,650 kg, 1,660 kg, 1,470 kg and 1,655 kg & 1,200 kg, 1,190 kg, 1,380 kg and 1,195 kg, respectively. Packed with Rack and Pinion power steering with tilt movement, it’s very handy and easy for driver to maneuver Isuzu D-Max on any terrain, be it rocky or muddy. The tilt movement is also helpful for attaining a better drive posture and hence improves the overall efficiency of the driver. Handling the suspension units are Double Wishbone Coil Spring at the front and Rigid Leaf Springs at the rear. Helping this unit work properly are Forged I Beam Reverse Elliot Type front axle and Rigid rear axle. The additional front Anti-roll bar is also available for improved stability. Keeping a check on safety front, Isuzu D-Max has been provided with Ventilated Disc brakes at front and Drum brakes at rear. There also are separate parking brakes for improved performance. The vehicle is also equipped with extra safety features like tubeless tyres, seat belts, K-Brace strong chassis with high torsional rigidity, heavy load body with 20% more thickness than the contemporaries. Aesthetically, Isuzu D-Max looks decent with next generation headlights, and is able to support many business needs, proving to be a rough and tough adventure companion as well. Overall aerodynamic design too helps D-Max to hit the top speed swiftly. Interior wise, this pickup has one of the richest cabins with features like separate adjustable headrest, AC with optional heater, vinyl seats and carpet, 2-speakers with audio pre-wiring, front door pocket with cup-holder, driver foot rest, key and headlamp buzzer, sliding + reclining front seat as well as a 12 volt mobile charge port.